Having handled challenges both internal and external, the veteran group stands strong with a new album and tour ready to go. For the overwhelming majority of Depeche Mode's storied three-decade ascension from disposable New Romantic heartthrobs to chart-topping rock stars who could fill stadiums, the division of labor between bandmates was never a question. ¶ Dave Gahan was the group's focal point: its preening figurehead, a leather-clad baritone and unrepentant hedonist with a lust for life (well, women, drugs and booze) that famously killed him for a few minutes in 1996. Martin Gore, meanwhile, was the brains of the operation. From 1981 onward, the soft-spoken multi-instrumentalist took the reins as primary songwriter and is most responsible for casting Depeche Mode's sonic template of brooding synthesizer soundscapes and danceable industrial dissonance. Until one day in 2005, at the outset of recording the British group's 11th studio album, "Playing the Angel," Gahan got fed up with the status quo. "I said, 'I contributed to everything you've done all these years. I want some back now,' " Gahan recalled, dragging on a cigarillo in a swanky hotel suite. "I said, 'Let's shake it up a bit. I'm going to bring in my stuff.' Martin said, 'Well . . . how many songs? How much?' OK, I get it. It was perceived as a threat." Never mind that Gore's lyrics -- meditations on consumerist greed, sexual politicking and exasperated spirituality, among other existential howls from the void -- elevated Depeche Mode beyond its shiny, happy New Wave roots and helped the group be taken seriously by critics, not to mention sell more than 100 million albums worldwide. In a separate suite on the other side of the hotel, Gore remembered his negotiation with Gahan somewhat differently. "Dave came to that project with a lot of bravado," Gore said. "He wanted to write half the album! We were all a little cautious of that. He had just put out his first solo album ['Paper Monsters'] and had really only just started writing." "So there was a bit of friction," admitted Gahan. It might have been the impasse to end Depeche Mode's quarter-century run crafting such exquisite cyber-pop hits as "Personal Jesus," "Strangelove" and "Master and Servant." But instead, it seems that Gore and Gahan's jockeying for position on "Playing the Angel" gave way to a happy bipartisanship on Depeche Mode's new album, "Sounds of the Universe," which hits retail April 21. Its propulsive lead single, "Wrong," cracked Billboard's Hot Modern Rock Tracks' Top 20 last month and a disturbing video for the song -- which follows a mysterious masked man piloting an out-of-control car through the streets of downtown Los Angeles -- was the most viewed clip on YouTube for two days following its posting. Not only are the bandmates getting along better than ever these days (the group's third remaining member, keyboard player Andrew Fletcher, has never rocked that boat), their late-inning burst of creativity resulted in enough new material for two albums. Writing for a year on his own, Gore came into the studio with 17 demo tracks; Gahan, having tempered his expectations after "Playing the Angel," arrived with five. Owing to Gahan's abhorrence of the double-CD format, "Sounds of the Universe" was culled down from more than 20 tracks to a concise 13 -- three of them written by the singer. 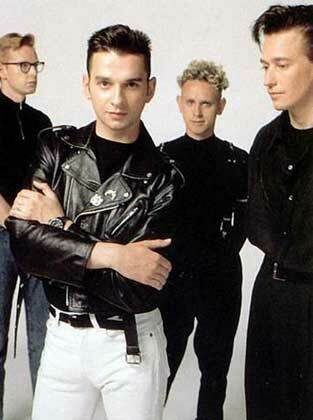 "For the first time during the completion of a Depeche record, I felt satisfied," Gahan said. "Not only with my participation, but our involvement together. I felt like Martin and I were on the same page in the studio quite often. It was something you didn't even have to talk about. That felt really great." The band members separately agree that Gahan's two solo albums, "Paper Monsters" (2003) and "Hourglass" (2007), have allowed the singer a certain hard-won acceptance of his role in Depeche Mode. "Before, he was just a frontman who sang someone else's lyrics," said Fletcher. "He was a bit uncomfortable. Now, he's writing and doing solo albums, he feels more part of the group." Producer Ben Hillier worked on both "Playing the Angel" and "Sounds of the Universe" and helped Gahan modulate his output for the new album. "Martin has been writing hits for 30 years," Hillier said. "Before his solo albums, Dave hadn't done any writing. Out of all the songwriters in the world to be in competition with, Martin is not the one to choose. So to rock up with a load of songs and expect to get them all on was a little bit hopeful." While the new music still recalls the dark synth-pop of DM's landmark 1991 album "Violator," it signals a shift into an era of emotional maturity for the band. Many of the songs on "Sounds of the Universe" grasp at themes of cosmic interconnectivity, spirituality and self-acceptance. On "Peace," written by Gore, Gahan sings: "I'm leaving my bitterness behind. . . . There is no space for regrets. . . . I'm giving all the positivity that I possess." It's hardly the same Depeche Mode that on 1984's "Blasphemous Rumours" lays out the manifesto: "I don't want to start any blasphemous rumors / But I think that God's got a sick sense of humor / And when I die, I expect to find him laughing." "I think I am more spiritually connected now," said Gore, 47. "More a part of the universe, no pun intended. I feel like I'm more in touch with my emotions. The biggest change in my life is that I stopped drinking three years ago. I feel like a different person and that helps the atmosphere in the band. There's a reason why we're a happier unit now." That puts the multi-instrumentalist on the same sobriety page as Gahan, 46, who famously gave up drugs and alcohol 12 years ago. No discussion of Depeche Mode is complete without mention of how the singer overdosed on a speedball of cocaine and heroin in Los Angeles in 1996 and was pronounced clinically dead for two minutes in the ambulance on the way to Cedars-Sinai Medical Center before he was revived. Suddenly self-conscious, Gore caught himself. He added: "You have to be careful when you talk about spirituality and stopping drinking in the same breath. You start sounding a bit holier than thou. That's the last thing I want to do -- come across as some new-age guru." He threw his head back and laughed. Hillier calls Gore's decision to give up booze a "breakthrough" for the band. "Dave has struggled with sobriety for quite some time and now there's a certain kinship developed through similar experience," the producer said. "And Martin was 100% dedicated. In the evenings, he wasn't going to go off partying." Come late April, a virtual flood of Depeche Mode content awaits the group's faithful. In addition to the album rollout, there's a CD-DVD set and a deluxe box-set -- a blunderbuss that will include bonus tracks, remixes and an "exclusive collection of demos" that includes a number of songs that didn't make the cut for "Sounds of the Universe" in addition to not one but two 84-page hardback books featuring lyrics and photos. As well, fans can subscribe to the iTunes Pass: for a flat fee of $18.99, listeners get the album and exclusive content -- new songs, remixes, videos -- for 15 weeks, a first-time deal offer from Apple's download platform. "It's one way around illegal downloads," said Fletcher. "We've tried to give the fans proper content. They'll pay for something if it's really good." Then there is Depeche Mode's road show. Time was when stadium shows were the exclusive province of monster rock acts -- say, Led Zeppelin or Genesis -- but never guys with synthesizers, drum machines and expensively asymmetrical haircuts. Depeche Mode shattered that glass ceiling in 1988 when it played to a sold-out crowd of more than 80,000 people at Pasadena's Rose Bowl at the close of the group's "Music for the Masses" tour. In May, Depeche Mode's well-oiled industrial complex clanks into gear, and the group will set off on a world tour. After touching down in Israel, the Baltic states, Scandinavia, Western Europe, Canada and the Eastern Seaboard, the group's "Tour of the Universe" arrives in Los Angeles for two gigs in August at the Hollywood Bowl and a third at the Honda Center in Anaheim. Having both lived and died in L.A., however, Gahan remains conflicted about his past here. "For a while, it was very difficult for me to go back to L.A.," Gahan said. "There were too many ghosts. At the same time, I've always been drawn to L.A. I lived there for six years. I fell in love there, got married there. And then I fell in love with the wrong stuff. That relationship fell apart." Moreover, with "Tour of the Universe," the band is poised to again upset conventional wisdom about synth-pop and arena-sized venues. "We've done a lot of touring for a so-called 'electronic band,' and we've proven that electronic music works in a live format and in a huge live format," Gore said. "In a way, what we're going to do now is a landmark like the Rose Bowl gig. We're going out to play our first stadium tour. There's not another electronic band that has gone out to play a stadium tour." It is one of pop music's few remaining summits for Depeche Mode to crest. Which brings up the question: How much longer does the group plan to go on? "Look at the age we're at," said Fletcher, 47. "It's hard to know how far you can go, into Stones territory. It's moment to moment. With this album, I think our music is still relevant." Gore put Depeche Mode's future prospects in finite terms: "When we're playing, you look in the front row and there's a lot of younger kids as well as the older audience. People are coming to hear the new record as well as songs we made 20 years ago. "Obviously, we are the worst people to have any subjectivity on the matter, but we are really aware of our legacy and not repeating ourselves. The day we start making music and don't think we're achieving something -- or stop enjoying it -- we'll stop."